Goals from Pierre Emerick Aubameyang and Granit Xhaka were not enough to secure all three points for Unai Emery's side. Arsenal's 11 match winning run came to an end on a cold, rainy day in south London, as the Gunners' drew 2-2 with Crystal Palace. Despite putting together an impressive winning run of 11 games in all competitions, a reocurring theme for Arsenal has been their slow starts to games. This was again the case at Selhurst Park. The Gunners were under the cosh for much of the first half and were fortunate not to go a goal down inside the 15th minute. After neat work down the right by Andros Townsend, his cross eventually fell to Wilfried Zaha, who's low driven effort clipped the outside of Bernd Leno's post. Moments later it was Townsend's turn to spurn a promising opportunity. After fantastic build up play by Palace, including a nonchalant flick from Zaha, the ball arrived at Townsend's feet just outside the six yard box, but the England international could only fire wide. Arsenal continued to withstand heavy pressure, but finally showed signs of life inside the 20th minute. After James McCarthur was dispossessed on the edge of the Palace box, the ball ricocheted to Alexandre Lacazette whose wild left-footed effort drifted harmlessly wide. 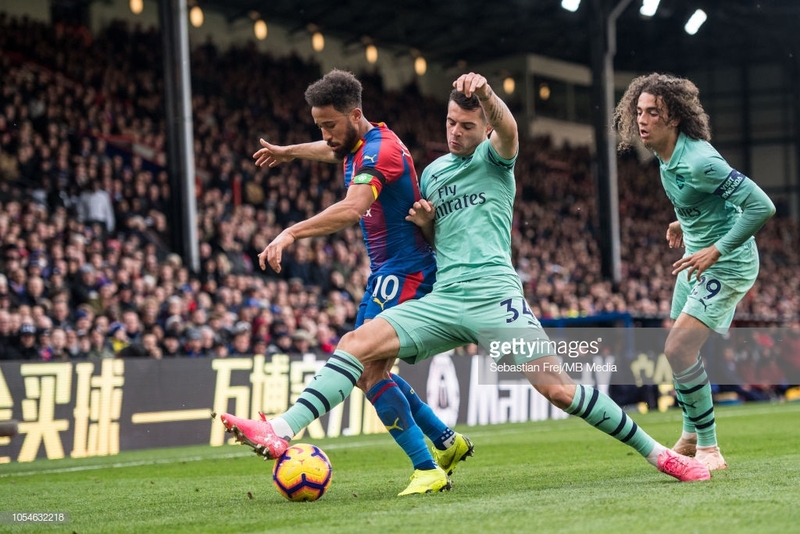 Just four minutes later, Mesut Ozil teed up Hector Bellerin, but the Spaniard’s tentative first touch enabled the Palace defence to block his effort toward goal. It looked like Arsenal were heading into the break level, but that wasn’t to be the case. On the brink of half time, a reckless challenge from Shkodran Mustafi on Cheikhou Kouyate after a Palace corner resulted in a penalty kick for Roy Hodgson’s men. Luka Milivojevic, who missed a spot kick just a week earlier against Everton, stepped up and confidently struck home. Arsenal trailed at half time for the first time since their opening day defeat to Manchester City. Whereas Crystal Palace had scored their first goal at Selhurst Park in the league this season. Arsenal have developed a reputation of being somewhat of a second half team, scoring 16 goals in the second halves of their league games so far this campaign. Just five minutes into the second half, the visitors were at it again. After being awarded a free kick on the corner of the box, Granit Xhaka curled a powerful shot into Wayne Hennessey’s top corner. A splendid goal which seemingly gave The Gunners’ impetus - as another five minutes in they took the lead. After an Arsenal corner in which Lacazette appeared to handle the ball, Pierre-Emerick Aubameyang arrived at the fast post and prodded the ball goalward. It looked as though Hennessey did enough to prevent Arsenal going in front but goal-line technology confirmed the ball had gone over the line by just 11 millimetres. Gabonese forward Aubameyang, who is now joint top scorer in the Premier League, had edged his side in front by the narrowest of margins. Emery’s sat noticeably deeper after scoring their second goal, and despite having several promising counter attacking situations, couldn’t find the right passes in the final third. They were made to pay for their lack of cutting edge with seven minutes of the game remaining. Zaha received the ball in the Arsenal area and was confronted by makeshift left-back Xhaka. The Ivorian attempted to jink past his opposite number before being clipped with the faintest of touches, leading him to go down in a heap and win another penalty for Palace. Milivojevic stepped up once again and scored from 12 yards - earning Palace a valuable, hard-fought point. With no further goals in the game, it meant the end of Arsenal’s winning run, although the north Londoners still remain unbeaten in 12 fixtures. As disappointing as it is to drop two points so late on in a game, Arsenal were far from at their best and this could yet prove to be a point gained over the course of the season.